This Pinkiblue.com website is subject to the following terms and conditions of use and sale (“Terms”) and all applicable laws. By accessing and browsing this website, you accept, without limitation or qualification, these Terms. If you do not agree with any of the Terms, please do not use this website. The Company reserves the right to change, modify, alter or otherwise update the Terms applicable to this website without prior written notice at any time, and from time to time, at the Company’s sole discretion. We will notify you of any such changes, modifications, alterations or updates to this website by posting notice of same on this website. Following the posting of any such notice, your continued use of this website will constitute your acceptance of the new terms and other policies, as modified, and you will be bound by said new terms and policies. The Company’s products and services available through this website (“Products”) may be ordered by only persons who reside in Canada. This website is not intended for access or use outside of Canada. You are responsible to ensure that your access to this website and the material and information available on or through it are legal in each jurisdiction in or through which you access or view the website and such material and information. This website is intended for use by adults only. If you use this website to purchase Products, you represent that you are of legal age to enter into any purchase agreement through this website and become bound by its terms. If you are under the age of majority in the jurisdiction in which you reside, your parent or guardian should use this website on your behalf and you should not use the website on your own or provide any personal information to the Company. The Company does not knowingly collect information from children under the age of 13. If you register on the site for the purchase of Products, you are responsible for maintaining the confidentiality of your account and password and for restricting access to your computer and your account, and you agree to accept responsibility for all activities that occur under your account or password. The Company reserves the right to refuse service, terminate accounts or cancel orders in its sole discretion. Products which may be purchased from this website are available for sale and distribution to customers in Canada only. The Company attempts to be as accurate as possible in describing all Products available for sale and/or distribution by the Company. However, the Company does not warrant that Product descriptions or other content of this website are accurate, complete, reliable, current or error-free. There may be slight variations from time to time in style or colour reproduction, or in text descriptions relating to the Products. As the actual colours you will see will depend on your monitor, the Company is unable to promise or guarantee your monitor’s display of any colour will actually reflect the colour of the Product delivered to you. The availability of certain Products may be limited, and Products may not be available for immediate delivery. The Company may revise or cease to make available any Products at any time without prior notice. In the event that the Company is unable to deliver to you a Product ordered due to lack of availability, the Company will notify you via e-mail and your order will be automatically cancelled with respect to such unavailable Product, provided that the Company may, in its sole discretion, contact you in order to allow you to maintain your order subject to a revised delivery time if and when the Product becomes available. The Company is pleased to accept orders provided they are for the personal, non-commercial use by its customers. The Company will not accept orders which are intended for resale or distribution for commercial purposes. The resale of any Products purchased on the website without the express written agreement of the Company is not permitted. Before submitting an order for the purchase of Products using this website, you will be shown an order confirmation screen (the “Order Confirmation”) describing, among other things, the Product(s) to be ordered, the purchase price and any applicable charges for shipping and taxes. When you submit your order (by pressing the “Complete Checkout” button), such order will constitute an offer from you to the Company to purchase the Product(s) described in the Order Confirmation, for the price and subject to the other charges, terms and conditions set out in the Order Confirmation. Orders are not binding on the Company until accepted by the Company. The Company’s acceptance of your order is evidenced by return e-mail from the Company indicating that your order has been accepted. All prices and Product orders are quoted and shall be processed in Canadian dollars. Although the Company strives to provide accurate product and pricing information, errors may occur. The Company reserves the right to correct any errors in pricing or product information and to modify the prices of Products, at any time, without prior notice. The Company cannot confirm the price of a Product until after you submit an order for the Product. In the event that the price or related information for a Product (as described on the website and/or the Order Confirmation) is incorrect due to an error in pricing or product information, the Company may, at its sole discretion, refuse or cancel your order, whether before or after the Company’s acceptance thereof. If there is such an error in pricing, the Company will cancel your order and reverse any charges that have been applied, then contact you to ask you to place a new order for the Product at the correct price. You hereby consent to the exchange of information and documents between you and the Company over the Internet or by e-mail, and you agree that these Terms, together with any applicable Order Confirmation(s) accepted by the Company in electronic form shall be the equivalent of an original written paper agreement between us. You further agree that all agreements, notices, disclosures and other communications that we provide to you electronically satisfy any legal requirement that such communications be in writing. The Company reserves the right, in its sole discretion, to limit quantities, terminate accounts and to refuse or cancel any order, including after the order has been submitted, whether or not the order has been confirmed or accepted and your credit card charged. In the event that your order is cancelled after your payment has been processed, the Company will issue a full refund. Payment can be made securely online by Visa and MasterCard. The credit card being used must be yours. All credit cards are subject to validation checks and authorization by the card issuer. If the issuer of your credit card refuses to authorize payment, the Company will not be liable for any delay or non-delivery of your order. In the event that your card authorization and validation is declined, the Company will cancel your order. For first time online customers, the Company may request that shipping be to the credit card billing address only. Terms of payment for any Products purchased through this website shall be determined at the Company’s sole discretion. Payment shall be made by credit card unless some other pre-arranged method of payment has been accepted by the Company. Any payments made by credit card are subject to the approval of the financial institution that has issued the credit card. The Company will ship the Product(s) ordered by you according to the delivery method you have chosen and to the address indicated in the Order Confirmation. Express delivery for Canadian orders is 1-2 business days and Standard Delivery is 4-7 business days, and longer in the case of remote locations. If you have ordered several Products we may deliver these Products in separate shipments as each item becomes available at no extra cost to you. To ensure prompt delivery we must have proper and complete address details and make one delivery charge per delivery address. A daytime telephone number is required in case we or our delivery agents need to contact you. Delivery times provided by the Company are estimates only. The Company shall not be responsible for any damages or costs resulting from any delays in delivery. In order to avoid lost packages, it is standard policy to request a signature for the packages we deliver. If no one is at the designated address at the time of delivery, the carrier will attempt to contact you to make alternative arrangements. It is understood and agreed that you as the customer accept this responsibility unless you specifically request a “signature-not-required” service, for which a small service charge may apply. At this time, such requests must be sent by e-mail at the time of purchase. Another option for customers is to put their daytime location (such as their work address) in the SHIPPING Address section of the Order information. The Company shall not be responsible for any damages or costs resulting from loss of the package after it is delivered to the address chosen by the customer, in the manner chosen by the customer. Unless otherwise stated, all prices quoted do not include shipping and handling charges and applicable federal and provincial sales taxes. Separate charges for shipping and handling and taxes will be shown on the Order Confirmation for each order, as applicable. Canadian customers are responsible for all sales, use, goods and services, harmonized sales, and other taxes and duties associated with the order. All Product(s) purchased from the Pinkiblue.com website are delivered to you by a third party delivery company, pursuant to a shipping contract. You shall become the owner of the Product(s) and shall assume the risks of loss at the time of delivery by the Company of the Product(s) to the third party delivery company. Each order will be accompanied with our return instructions. The Company offers (a) a full refund* or exchange on all regular priced online purchases of products if they are returned in the condition in which they were sold, with original tags**, within 30 days and (b) an exchange or credit note on all sale priced or discounted online purchases of Products returned in the condition in which they were sold, with original tags**, within 14 days of purchase. Credit notes would be for the lesser of a) the amount originally paid, or b) the current ticketed price of the item(s) in question. *The company will reimburse your freight costs only if we were at fault. If an item is returned for refund, and it was originally sent to you with free shipping, the Company may deduct the cost of standard shipping from the refunded amount, unless we were at fault. Only one return per order will be accepted. Therefore, it is best to carefully examine ALL items received to ensure satisfaction before making a return of a portion of your order. Until the Company receives the returned item(s), you are responsible for any loss. Where appropriate, your payment will be refunded to your account within thirty (30) days of receipt. If you return an item not accompanied by the required paperwork there may be a delay in processing your order and in refunding your money. You can return products purchased on this website at Boutique Pinkiblue retail store for a refund. 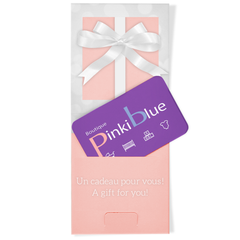 For customer convenience, Boutique Pinkiblue retail stores do accept exchanges. THE COMPANY MAKES NO REPRESENTATION OR WARRANTY REGARDING THE FUNCTIONALITY, THE GOOD WORKING ORDER OR CONDITION OF THIS WEBSITE, ITS SUITABILITY FOR USE, OR THAT ITS USE, OR ANYINFORMATION OR MATERIAL, INCLUDING ANY DOWNLOADABLE SOFTWARE, ACCESSED FROM OR THROUGHTHIS WEBSITE WILL BE UNINTERRUPTED OR ERROR-FREE. THE COMPANY DOES NOT REPRESENT, WARRANT OR UNDERTAKE THAT ANY ERRORS ON OR RELATING TO THIS WEBSITE WILL BE CORRECTED, OR THAT ANY SERVER FROM WHICH THE WEBSITE IS OPERATED IS OR WILL BE FREE FROM VIRUSES OROTHER HARMFUL COMPONENTS. EXCEPT AS EXPRESSLY PROVIDED FOR IN THESE TERMS, THIS WEBSITE AND ALL MATERIALS, PRODUCTS AND INFORMATION PROVIDED THROUGH OR ON THIS WEBSITE ARE PROVIDED TO YOU ON AN “AS IS”, “WITH ALL FAULTS” BASIS AND THE COMPANY DOES NOT MAKE OR GIVE ANY REPRESENTATION, WARRANTY ORCONDITION OF ANY KIND, WHETHER EXPRESS OR IMPLIED, WRITTEN OR ORAL, STATUTORY OR OTHERWISE, INCLUDING WITHOUT LIMITATION (i) WARRANTIES AS TO UNINTERRUPTED OR ERROR FREE TRANSACTIONS, PRIVACY, OR SECURITY, (ii) ACCURACY, ADEQUACY OR COMPLETENESS OF INFORMATION; OR (iii) MERCHANTABILITY, QUALITY, TITLE, DURABILITY, SUITABILITY, NON- INFRINGEMENT OR FITNESS FOR A PARTICULAR PURPOSES, OR THOSE ARISING OUT OF A COURSE OF DEALING OR USAGE OF TRADE.THESE EXCLUSIONS ARE IN ADDITION TO ANY SPECIFIC EXCLUSION OTHERWISE PROVIDED IN THESE TERMS. BECAUSE CERTAIN FEDERAL, STATE OR PROVINCIAL LAWS DO NOT PERMIT THE EXCLUSION OF CERTAIN WARRANTIES, THESE EXCLUSIONS MAY NOT APPLY TO YOU. TO THE MAXIMUM EXTENT PERMITTED BY APPLICABLE LAW, IN NO EVENT WILL THE COMPANY BE LIABLE FOR ANY DAMAGES OR LOSSES OF ANY KIND, WHETHER DIRECT, INDIRECT, INCIDENTAL, SPECIAL, EXEMPLARY, PUNITIVE OR CONSEQUENTIAL, HOWSOEVER CAUSED, INCLUDING BUT NOT LIMITED TO, ANY LOST DATA, LOST PROFITS, LOST SAVINGS, LOSS OF GOODWILL, LOST BUSINESS, LOSS OF USE OR LACK OF AVAILABILITY OF FACILITIES INCLUDING COMPUTER RESOURCES, ROUTERS AND STORED DATA, ARISING OUT OF OR IN CONNECTION WITH THE USE OF THIS WEBSITE, INCLUDING WITHOUT LIMITATION THE MATERIALS OR INFORMATION PROVIDED THROUGH THIS WEBSITE, THE PRODUCTS, OR THE TRANSACTIONS CONDUCTED FROM ON OR FROM ANY COMPANY WEBSITE, EVEN IF THE COMPANY OR ANY OF ITS LAWFUL AGENTS, CONTRACTORS, EMPLOYEES OR MANDATARIES HAVE BEEN ADVISED OF THE POSSIBILITY OF SUCH DAMAGES OR CLAIM. IN PARTICULAR, AND WITHOUT LIMITING THE PRECEDING PARAGRAPH, IN NO EVENT WILL THE COMPANY BELIABLE TO YOU FOR DAMAGES OR LOSSES RESULTING FROM VIRUSES, DATA CORRUPTION, FAILED MESSAGES, DAMAGES ARISING AS A RESULT OF: TRANSMISSION ERRORS OR PROBLEMS,TELECOMMUNICATIONS SERVICE PROVIDERS, THE COMPANY’S CONTRACTORS, THE INTERNET BACKBONE, THIRD-PARTY SUPPLIERS OF PRODUCTS OR SERVICES, DAMAGES OR LOSSES CAUSED BY YOU, OR YOUR RESPECTIVE EMPLOYEES, AGENTS, MANDATARIES OR SUBCONTRACTORS, OR OTHER EVENTS BEYONDTHE REASONABLE CONTROL OF THE COMPANY. IF, DESPITE THE LIMITATIONS ABOVE, THE COMPANY IS FOUND LIABLE FOR ANY DAMAGE OR LOSS IN CONNECTION WITH THIS WEBSITE, IN NO CASE WILL THE COMPANY’S TOTAL LIABILITY ARISING UNDER ANY CAUSE WHATSOEVER (INCLUDING WITHOUT LIMITATION BREACH OF CONTRACT, NEGLIGENCE, GROSSNEGLIGENCE OR OTHERWISE) BE FOR MORE THAN THE AMOUNT PAID BY YOU FOR THE SPECIFIC PRODUCTS ORDERED UNDER THIS AGREEMENT AND TO WHICH THE CLAIM RELATES. IF YOU ARE DISSATISFIED WITH THESE TERMS OR THIS WEBSITE, YOUR SOLE AND EXCLUSIVE REMEDY IS TO DISCONTINUE USING AND ACCESSING THIS WEBSITE. CERTAIN FEDERAL, STATE OR PROVINCIAL LAWS MAY NOT ALLOW LIMITATIONS ON IMPLIED WARRANTIES OR THE EXCLUSION OR LIMITATION OF CERTAIN DAMAGES. IF THESE LAWS APPLY TO YOU, SOME OR ALL OFTHE ABOVE DISCLAIMERS, EXCLUSIONS, OR LIMITATIONS MAY NOT APPLY TO YOU, AND YOU MIGHT HAVEADDITIONAL RIGHTS. FOR THE PURPOSES OF THIS SECTION, “THE COMPANY” SHALL INCLUDE THE COMPANY’S RESPECTIVE DIRECTORS, OFFICERS, EMPLOYEES, AGENTS, MANDATARIES, CONTRACTORS AND THIRD-PARTY SUPPLIERS. THIS SECTION SHALL SURVIVE THE TERMINATION OR EXPIRY OF THIS AGREEMENT. Material on this website, including but not limited to texts, images, illustrations, software, audio clips and video clips, is owned or otherwise provided by the Company, and the Company does not represent or warrant that such material does not infringe the rights of any other person or entity. The material on this website is protected in Canada and in other jurisdictions by the Copyright Act and by virtue of the applicable international treaties. Consequently, the material on this website may not be copied, reproduced, republished, downloaded, posted, transmitted, distributed or modified, in whole or in part in any form whatsoever, including but not limited to text, audio or video, without the prior written consent of the Company. Trademarks, logos and service marks (collectively, “Marks”) displayed on this website are registered or unregistered Marks of the Company or others, are the property of their respective owners, and may not be used without written permission of the owner of such Marks. Nothing in this website is to be interpreted as conferring a right to use the Marks or the material protected by the Copyright Act. Notwithstanding the foregoing, the Company authorizes you to make one electronic or paper copy of the information posted on any page of this website provided that the copy is used solely for non-commercial, personal purposes and, in each and every case, provided that any such copy remains protected by all copyright, trademarks, service marks and other proprietary notices and legends contained on such website. This license does not include any resale of this website or its contents; any collection of product listings, descriptions or prices; any other derivative use of this website or its contents; any downloading or copying of information for the benefit of any merchant; or any use of data mining, robots, or similar data gathering and extraction tools. You may not frame or utilize framing techniques to enclose any page on this website or any trademark, logo or other proprietary information (including images, text, page layout, or form) of the Company without express written consent of the Company. You may not use any meta tags or any other “hidden text” utilizing the Company’s name or trademarks without the express written consent of the Company. Any unauthorized use of this website and/or its contents terminates the permission or license granted by the Company. Except as otherwise may be expressly provided herein, nothing contained in these Terms shall be construed as conferring by implication, estoppel or otherwise any license or right under any copyright, patent, trademark or other intellectual property right of the Company or any other person or entity. The Company may monitor the access to its websites and other activities in relation to its website and may intervene in this regard. However, the Company makes no representation and gives no warranty to that effect. You consent to such surveillance and intervention, if the Company ever decides to do it. You agree not to introduce into or through this website or any other Company website any information or materials which may be harmful to others. Among other things, you agree not to include, knowingly or otherwise, any error or defect in material or information which may, among other things, be a libel, slander, defamation or obscenity, or promote hatred or otherwise give rise to a criminal offence or civil liability on the part of any person or entity. Company may, for any reason in its sole discretion and without notice to you, terminate, change, suspend or discontinue this website or any aspect of it, and Company will not be liable to you or any third party for doing so. Company may also impose rules for and limits on use of this website or restrict your access to part, or all, of this website without notice or liability. All rights not expressly granted in these terms are reserved to the Company. These Terms shall inure to the benefit of and be binding upon each of the parties hereto and their respective successors and permitted assigns. This website is controlled and operated by the Company from Montreal, Quebec, Canada and these terms, this website, any use of this website and any transaction conducted on or from it shall be governed by the laws of the Province of Quebec and the laws of Canada applicable therein without reference to principles of conflict of laws. The application of the United Nations Convention on Contracts for the International Sale of Goods is expressly excluded. You acknowledge and agree that any dispute that may arise between you and the Company in respect of these Terms and the transactions contemplated herein shall be resolved by the provincial and federal courts and tribunals sitting in the province of Quebec and you hereby irrevocably submit and attorn to the personal and exclusive jurisdiction and venue of these courts. The Company will not be in breach of these Terms or otherwise liable for any delay in performance to the extent that any delay or failure results from circumstances beyond its reasonable control including, without limitation, strikes, lockouts and other industrial disputes, breakdown of systems or network access, flood, fire, explosion or accident. If any one of these conditions shall be deemed invalid, void, or for any reason unenforceable, such condition shall be deemed severable and shall not affect the validity and enforceability of any remaining condition. The Company makes no representation that materials, information or Products provided on or through this website are appropriate or available for use in other locations or jurisdictions. Those who choose to access this website from other locations or jurisdictions do so on their own initiative and are responsible for compliance with local laws, if and to the extent local laws are applicable. The failure of the Company to enforce any provisions of these Terms or to respond to a breach by you or any third party of these Terms shall not in any way waive the right of the Company to subsequently enforce any of the terms and conditions contained herein or to act with respect to similar breaches. Products sold or delivered under this Agreement shall be subject to export control laws and regulations of Canada. You agree to comply at all times with all such laws and regulations. You hereby agree to defend and hold the Company harmless against all claims, damages or liability resulting from breach of the foregoing. These Terms, together with all other agreements, terms or conditions incorporated or referred to herein constitute the entire agreement between you and the Company with respect to the use of this website and any transaction conducted on or from this website and its contents, and supersede any prior understandings or agreements (whether electronic, oral or written) regarding the subject matter hereof, and may not be amended or modified except in writing, or by the Company making such amendments or modifications available to it pursuant to the terms here of. You may not assign your rights or obligations herein without the express written consent of the Company. The Company reserves the right, at its sole discretion, to terminate your access to all or any part of this website, with or without notice. These terms and any supporting or ancillary documents are drafted solely in English. A French version of these Terms is available.